It still remains to be seen to what extent the Trump administration´s policies will impact the US market for information and communication technology. 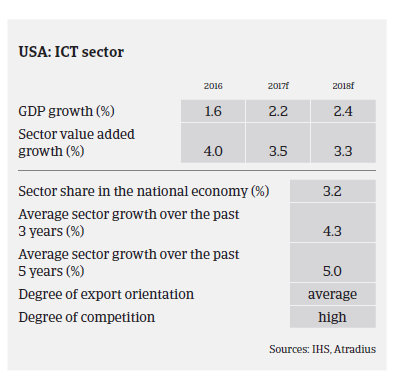 In 2016 the US ICT market benefitted from stable economic growth and robust private consumption, which was helped by wage growth, employment gains and decreased energy prices. According to the European IT observatory EITO, ICT sales growth in the United States increased 3.2% year-on-year in 2016, with IT sales growing 4.3% and business with software services rising 9.0%. In 2017 the US ICT market is forecast to grow further, by 3%-4%. Smartphone revenues are expected to reach USD 55.6 billion in 2017, up 2% year-on-year, with more budget models to hit shelves in 2017. That said, sales of tablets, one of the best performing products over the past few years, are expected to decrease 8% this year, to USD 16 billion, as adoption rates level off and replacement cycles slow down. Likewise, laptop and desktop revenues are expected to decrease 3% and 8%, to USD 15.6 billion and USD 3.9 billion respectively. As in 2016 the main growth driver will be emerging technologies with connectivity, including digital assistants and 3D printing, augmented/virtual reality, autonomous vehicles and medical and sports technologies. These are expected to to show double-digit growth rates. Despite the mainly robust growth rates in many ICT segments, high competition is still leading to low pricing strategies and margin compression for distributors and retailers alike. Margins of manufacturers are impacted by the already high market penetration of mature product categories and the subsequent need for innovation. Many ICT businesses continue to rely heavily on bank facilities and external financing, resulting in leveraged balance sheets. ICT insolvencies are expected to remain stable or even to increase slightly in 2017, given high competition, many start-ups and short product cycles. 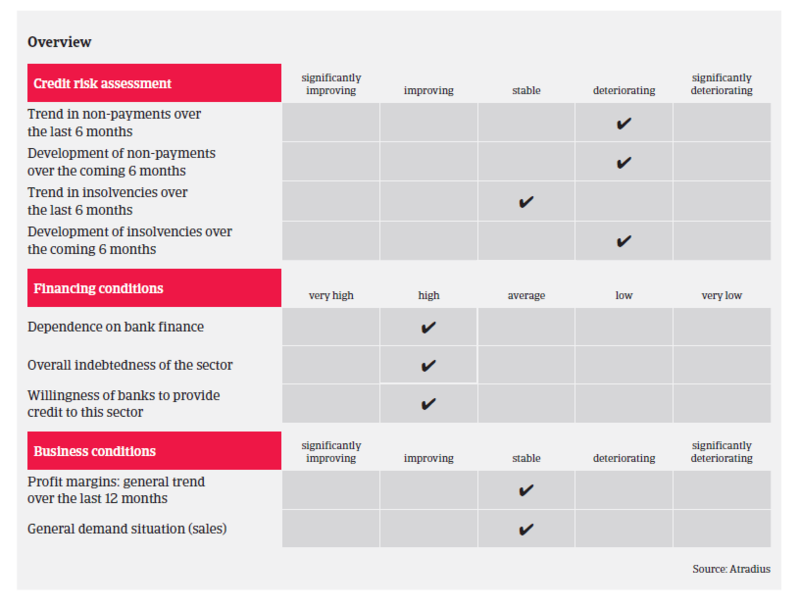 Payment terms in the ICT sector commonly range between 30 and 90 days, but in some cases can take even 120 days. When payment delays occur, they generally relate to disputes over product pricing or other issues, as opposed to liquidity concerns. Manufacturers often offer price protection or discounts on products in order to move inventory ahead of the rapid innovation of technology experienced in the market. This can lead to disputes and ultimately an increase in non-payments until the issues can be resolved. It remains to be seen to what extent the Trump administration´s policies will impact the US market for information and communication technology. The announced tax cuts and stimulus measures could lead to increased household purchasing power and a further decrease in unemployment, boosting additional consumer spending for ICT. However, a massive restriction of the H1-B immigration visa programme for high-skilled immigrant workers could affect recruitment policies. At the same time, higher tariffs on electronic imports from Asia could hurt producers and increase sales prices, while US ICT exporters could be affected by an increase in global protectionism (especially those selling to Latin America). 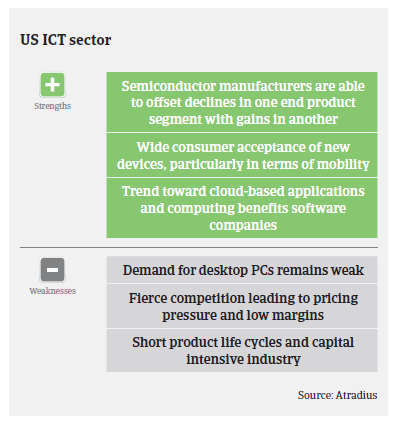 Until there is more clarity about the implications of potential changes in US trade and economic policies our underlying underwriting strategy remains cautiously open, with a focus on favourable subsectors such as smartphones, tablets and health technology products along with other emerging technologies, while steering clear of unfavourable or declining subsectors like PCs. We employ a more cautious approach in certain niche segments or markets (such as consumer electronics exporters selling to South America due to the on-going economic difficulties in some countries). When analysing buyers, the level of transparency in their products and their life cycles – including any insight into buyback arrangements for old or obsolete products – is key. With short life cycles and technology quickly becoming obsolete, it is important for us to know which end markets and subsectors are being served. Payment Practices Barometer for the Americas (NAFTA and Brazil) shows that 93% of respondents reported late payment from B2B customers over the past year. Future US construction growth could get an additional boost if, as announced, the new US administration invests heavily in infrastructure improvements.